Ice cream happens to be one of our favorite treats, so a visit to Cruze Farm Dairy was a welcome stop. 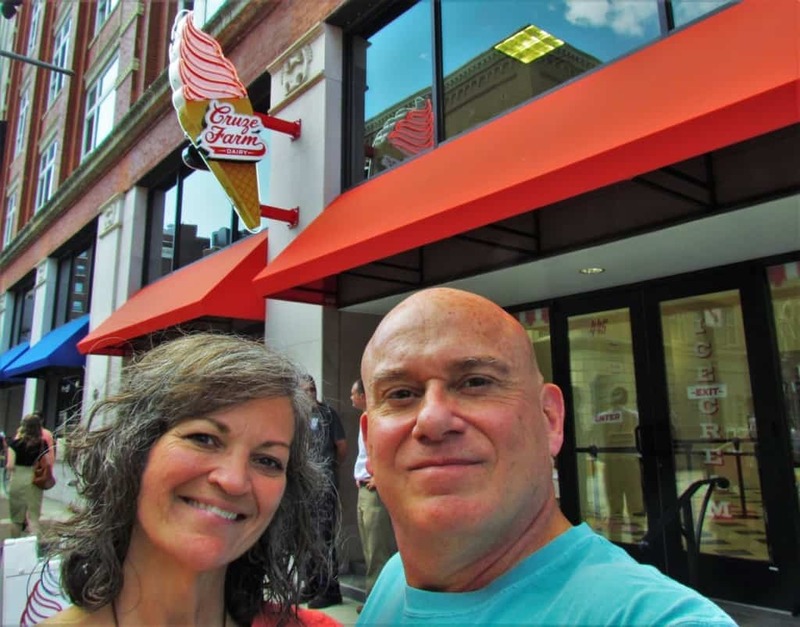 Our “foodie” friends in Knoxville, Tennessee had clued us in on this downtown destination. The buzz focused around the farm fresh taste of their products. After our first dinner date in Market Square, we made our way around the corner to investigate this sweet spot. 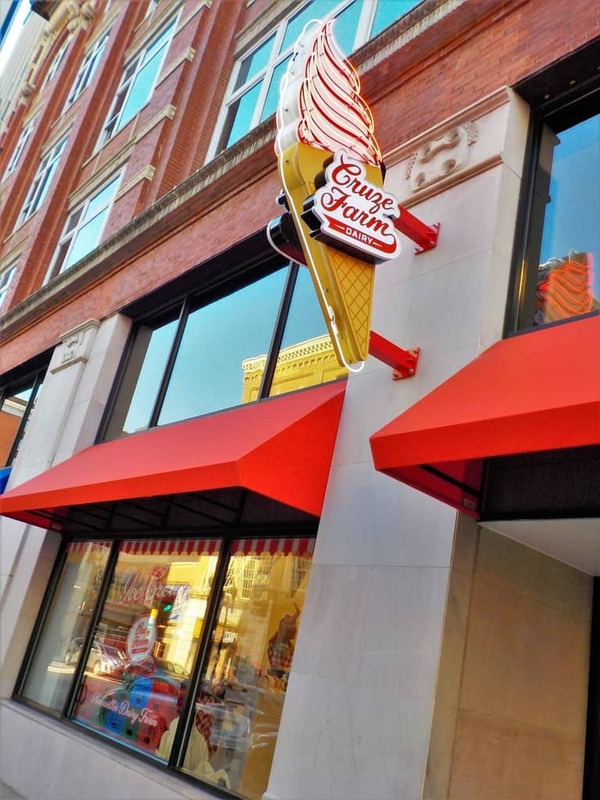 It was easy to find Cruze Farm dairy, since their neon ice cream cone sign hung out from the side of the building. Of course, the gathering of ice cream eaters was certainly a dead giveaway. Once we stepped inside, we were greeted by an immaculately clean looking space. The use of white certainly creates a nice backdrop for the vivid photos that adorn the walls. It caught us off guard to see actual dairy cases, since we had assumed it was strictly an ice cream shop. I guess the name should have clued us in. We weren’t sure what to expect at Cruze, but the steady traffic suggested it should be good. While we have seen more flavor options at other stores, none had the unique combination style. Of course, first we had to decide on the final product. 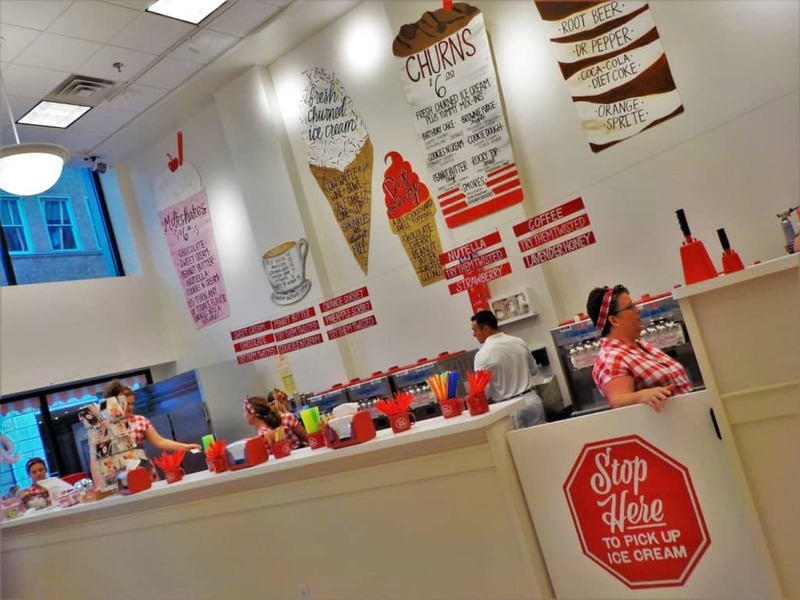 Besides cones, the menu is filled with shakes, floats, and churns, which are a mixture of farm fresh ice cream and cookies or candies. Everything sounded delicious, but we stuck with our original plan to get cones. Regular or cow size? Now, I don’t want it to be a direct reflection, but let’s go cow size. We let a lot of people pass us in line, as we continued to narrow down our final choice. What flavor(s) would we pick? Yes, flavors, since Cruze is set up with soft serve machines that sit in tandem. Customers can choose one flavor or a swirl of what’s brewing in the pair of dispensers. They have a few standard flavors that are combined with rotating ones to create a wide range of options. A person who visits on multiple occasions will find new combination choices to try. Once we finally selected our flavors there was one more choice. Did we want our farm fresh ice cream to be dipped? Although the options of chocolate, peanut butter, cherry or toasted coconut toppings were attractive, we decided to hold firm with just the ice cream. After all, with all of this time invested in decision making, we definitely wanted to savor the flavor. After our first experience with the farm fresh goodness that came served in a cone, we were ready for another. Of course, since we had recently eaten dinner, our bellies told us that would be a bad decision. Oh well, we walked away knowing that we would be in this area again on the next day. Sure as shooting, we happened to find a little time in our schedule to make another stop after our lunch break. Once again, the creamy goodness was waiting for us. This time we looked less like novices, as we were able to step up and order at will. 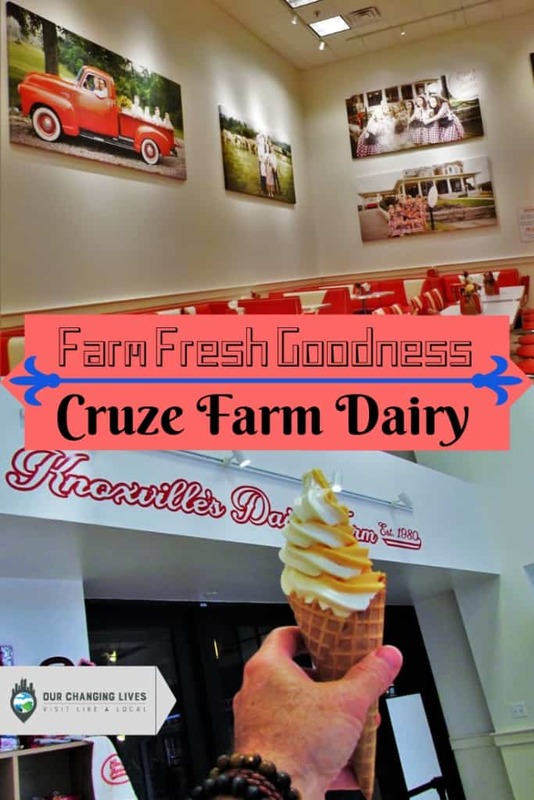 Now we just need to find a reason to return to Knoxville for more Cruze Dairy Farm ice cream. Wow that cone looks divine Jeff. Nothing like a fabulous ice cream shop. I too get all giddy whenever I uncover these spots. Fabulous. Thanks, Ryan. Glad to hear we aren’t the only ones who get excited. Ice cream us my fave dessert, too. But is it a soft-serve ice cream, not the ones you scoop! I always thought soft-serve was a lower quality one. It depends on the quality of the ingredients being used to make it. This place is top notch. You can’t go wrong in visiting a dairy! everything they serve is always so fresh tasting. That ice-cream at Cruze looks amazing! Knoxville is a city I have yet to explore. 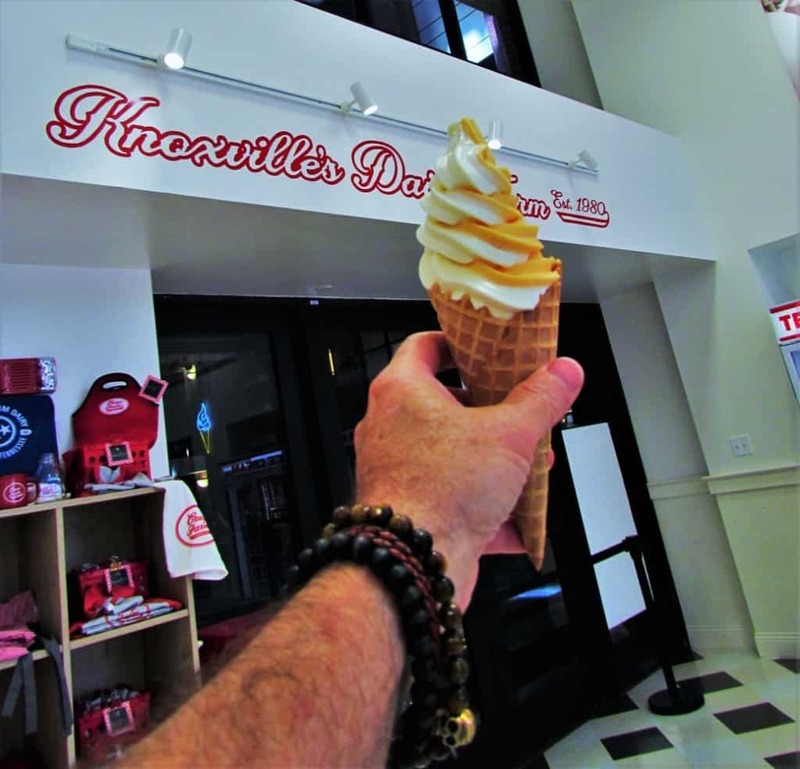 Cruze Farm Dairy and an ice cream treat look like they deserve to be added to anyone’s touring plans. Thank you for sharing your yum-experience! You are quite welcome. We hope you have a chance to visit.